Spreading ground cover-type perennial plants have a trio of uses. They can serve as living mulch in established flower beds and as lawn alternatives—or be mixed in with other grasses in a lawn. They work especially well to fill in cracks and spaces in paving. Plants such as spreading sedum and creeping thyme are favorites between pavers, bricks, and stone because they can handle some foot traffic and neglect. You can purchase many types of walkable ground covers at a good nursery, but two companies have chosen some of the best in the category and market them under the names Stepables and Jeepers Creepers. The Under A Foot Plant Company (the Stepables parent company) has copyrighted its foot traffic designations, which tell you how much walking its plants can handle. Part of the beauty of plants that can survive between pavers and in moderate in traffic areas is that they can take care of themselves. Some supplemental water and a little TLC are needed when the plants are first in the ground and getting established, but after that, they'll just need to receive periodic water and they should be able to grow and spread. Most of the plants showcased here spread at a rate of about 6–12 inches per year. Growth rate is dependant on weather and growing conditions. Be careful about choosing a rapid spreader if you are planting near a lawn or garden and don't want it there, as these plants don't know when to stop. Even those gardeners who've fought to keep dwarf bugleweed (Ajuga "Chocolate Chip") in check might admit paved areas are an appropriate and attractive use for it. Depending on the gardener, ajuga is either looked on as a ground cover or a weed. Ajuga "Chocolate Chip" is a bit better behaved than its species parent, but it is still an enthusiastic grower, so don't put it where it can't sprawl. What's special about Ajuga in general is that it will grow in difficult shady spots, such as the dry shade under trees. Ajuga "Chocolate Chip" is shorter than other Ajuga, less invasive, and has narrower, more delicate foliage. The leaves are dark green tinged with bronze or chocolate brown. It's also deer resistant. The flowers on Ajuga "Chocolate Chip" are a purple-blue and bloom in spring. They stand above the foliage at a height of about 4 inches and are attractive to bees and butterflies. Mount Atlas daisy (Anacyclus "Silver Kisses") has fern-like, silvery gray foliage and 1–2-inch flowers with white petals and a yellow center when it blooms in spring and early summer. The flowers need full sun, closing in the evening and even on cloudy days. It's not a long-lived perennial, but it will generally self-seed and keep going once established. Anacyclus prefers a slightly alkaline soil and thrives in clay. Rupturewort (Herniaria glabra), is known as green carpet in the landscaping business because of its ability to spread and cover. One plant can easily spread out to 2 feet. Because Herniaria has a tap root, it is extremely drought tolerant. Many people never notice it flowering because the white blossoms are so tiny and have no petals. The foliage remains attractive, turning a bronzy red in winter. It works in heavy foot-traffic areas because without flowers, it doesn't attract bees. Laurentia (Isotoma fluviatilis "Blue Star Creeper"), a pretty little workhorse, has been a top seller for the Stepables brand. It's easy to grow and extremely versatile because it's so rugged. You can use "Blue Star Creeper" around pools, in the garden, on pavers, and even in pots. It can also be a lawn substitute. A great feature of "Blue Star Creeper" is that it remains in bloom pretty much all season, until frost. In warmer climates, Isotoma can remain evergreen all year, but in hot summer climates, it will need some shade in the summer. Be patient with "Blue Star Creeper." It can take up to a year to get established, but once it is, it will take off. New Zealand brass buttons (Leptinella squalida) looks attractive, doesn't attract a lot of bees, and feels nice under your feet. It does double duty as a lawn substitute and as an edging plant, keeping the other spreaders in their place. The fern-like foliage does resemble small yellowish buttons that turn a bronzy red in fall. It's evergreen only in warmer climates, but it's usually hardy down to USDA Zone 5. Double bird's foot trefoil​ (Lotus corniculatus "Plenus") is the double-flowered form of bird's foot trefoil. It adds texture and color in the tightest spots. Small, orange buds open into pea-like yellow flowers and dot this mat-forming spreader in early summer. Lotus corniculatus is another good choice as a lawn substitute. It's very adaptable to any sunny spot, even in poor soil. Mowing doesn't bother it. It's especially good in clay soil. Creeping mazus (Mazus reptans "Purple") is a tiny plant, reaching about 2 inches in height. What it lacks in height, it makes up for in spread, forming a dense mat that in late spring is covered in lavender-blue flowers, like small snapdragon blossoms. It conveniently blooms about the same time as daffodils, for a stunning combination. When the flowers fade, the Mazus foliage will still look good. Because it is such a tiny plant, it is less aggressive than many of the creeping perennials and less invasive. Mazus looks lovely in rock gardens. There's also a white variety called Mazus reptans "Alba." Some plants were just made to be combined with stone. Creeping wire vine (Muehlenbeckia axillaries) is wiry, but it leaps more than creeps. On its own, creeping wire vine isn't much to look at, but put it in a rock garden and it just begs to be touched. It's a fast spreader and should be used where you don't care where it meanders. It's useful on slopes that need a quick cover. Mowing once a year in spring will refresh and thicken the plants. The tiny, round leaves are a nice glossy green. They turn bronze toward winter and sometimes in extreme heat. The flowers aren't much to talk about, but white berries will form toward the end of summer. Muehlenbeckia is very tolerant of poor soil and drought when established. It appreciates some shade in hot weather and can be evergreen in warmer climates. Scotch moss (Sagina subulata "Aurea") favors clay soil and has a yellow tint to the foliage. In spring it sprouts tiny, star-shaped white flowers. This plant can be evergreen in warmer climates, where it also appreciates a bit more shade; otherwise, it becomes unattractive until fall. It dislikes drought and the other extreme, wet feet. Sagina looks like a scratch-proof sponge but feels so much softer. Both Irish Moss (Sagina subulata) and Scotch moss (Sagina subulata "Aurea") are covered in tiny, star-shaped white flowers in spring. They spread rapidly to form a carpet that looks especially nice against gray stone. Irish moss is less particular than Scotch moss about the soil it's grown in. Like its cousin, it can be evergreen in warmer climates, where it also appreciates a bit more shade or else it becomes unattractive until fall. Irish moss dislikes drought and the other extreme, wet feet. 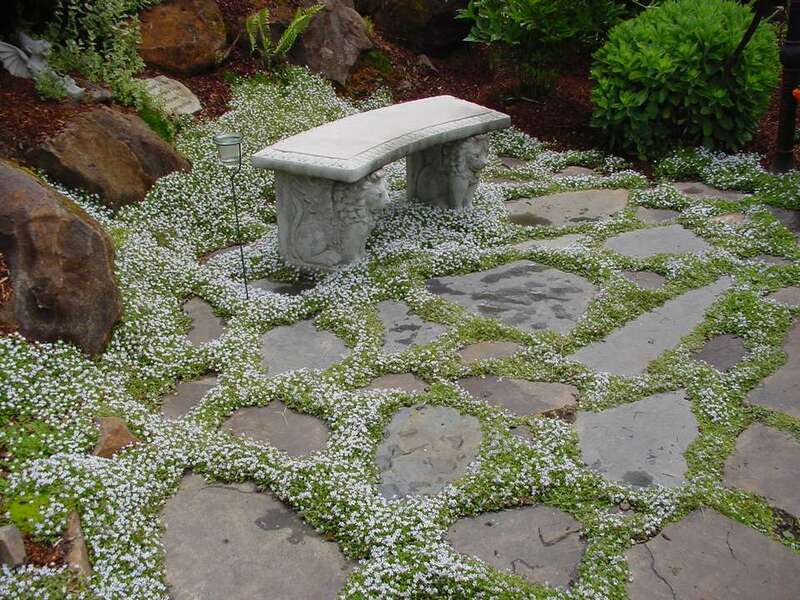 The spreading, low-growing sedums, such as Caucasian stonecrop (Sedum spurium "John Creech") are standards in rock gardens, where they spill over the stones and seem to require no care whatsoever. They are also a varied lot, with succulent-like foliage in round or spiky leaves tinted blue, yellow, purple, and emerald green. They form tight mats that usually don't get taller than 6 inches, and they reach that height only when in bloom. Sedums are capable of rooting along their stems where they make contact with the ground. The foliage may get darker in the fall and is often evergreen. Sedums can be a bit slick to walk on but look nice between pavers and encircling patios. Oddly, deer don't seem to bother the creeping sedums the way they do the upright varieties. Sedum spurium "John Creech" has bright green, dense foliage with mauve-pink flowers. It forms a denser mat than many of the other Sedums in the spurium species. It doesn't mind poor soil or drought but doesn't like wet feet. White diamond stonecrop (Sedum pachyclados "White Diamond") has rich, blue foliage that forms in tight, ground-hugging rosettes, forming a carpet. It's called "White Diamond" because when a drop of water lands on a leaf, it catches the light like a white diamond. There are small white, star-shaped flowers in the summer, but it's the foliage that shines here. All of the thyme varieties are relatively low-growing creepers, but many seem to die out quickly. Creeping thyme (Thymus praecox "Elfin") remains attractive, with soft, gray-green foliage that forms a slow spreading, tightly matted mound. This is a perfect plant for between pavers, and if you have the patience, it makes a nice lawn alternative. The lavender-pink flowers bloom in early summer and attract bees and butterflies. Being a thyme plant, it's also edible. Looking for a lucky four-leaf clover? Bronze Dutch clover (Trifolium repens "Atropurpureum") can give you a carpet of them. The dark reddish leaves are edged in green and accented with white clover flowers in the summer. It has a multitude of common names, including white Dutch clover and black shamrock. The Proven Winners brand has a selection called "Dark Dancer." Whatever the name, this is a particularly attractive plant for its foliage, which looks good planted along edges, between pavers, and even in pots. It's also useful for erosion control on slopes, and it can be evergreen in warmer climates. Many perennial gardeners are familiar with spike speedwell (Veronica spicata), the tall-growing Veronica plants, but are not so familiar with the creeping ground cover Veronicas. There are plenty of gorgeous blue-flowered creeping Veronicas, such as "Waterperry Blue" and "Turkish Veronica," but golden creeping speedwell (Veronica repens "Sunshine") stands out for its color. Actually, pairing "Sunshine" with one of the blue-flowering Veronicas could make a wonderful combination. Sunshine's white flowers are nearly as eye-catching as its foliage. Veronicas are alpine plants, and they don't really like being used as lawn alternatives. Tuck them somewhere where their roots are kept cool, though, such as between pavers or in rock gardens or troughs, and they'll deliver for you. Veronicas are deciduous, meaning they'll drop their leaves in the fall. You'll need to clean out the fallen leaves so the new growth in spring isn't smothered. For most of us, violas aren't really an option as a ground cover. Gardeners in cooler climates can put these violets to more use than just spring and fall container plants, though. The dark, almost black leaves of the "Purpurea" viola (formerly Viola labradorica "Labrador Violet," now reclassified as Viola riviniana "Purpurea") are the perfect foil for the lilac-purple flowers that can bloom for months if the temperatures don't climb. Violets appreciate a rich, moist soil and shade in the heat of summer. They don't spread quickly, but they will self-seed. They are not what you'd traditionally think of as a ground cover, but given the right conditions, they are charming.